55-59 Cab-Small Window FCGA-59 $6599. 55-59 Cab no floor-Small W FCG-33 $2299. 55-59 Cab-Large Window FCGA-59B $6599. 55-59 Cab no floor-Large W FCG-33B $2299. 55-59 Dash Blank FCGS-59D $ 299. 55-59 Drag Package FCG-33DP $3899. 55-56 Tilt Front End FCGI-56 $1899. 55-59 Dash Blank FCG-33Z $ 299.
for as little as $50 w / purchase. FCG-17 $ 399.
for as little as $50 w / purchase. FCG-18 $ 399.
for as little as $50 w / purchase. FCG-19 $ 399. 57 Tilt Front End FCGI-57 $1899. 55-56 One Piece Front End FCG-71 $1499. 57 Pre-Split Tilt Front End FCGI-57P $1999. 55-56 OPFE 3" Cowl Induct. FCG-71C $1499. 57 Tilt Front 3" Cowl Induc. FCGI-57C $1899. 57 One Piece Front End FCG-72 $1499. 57 Pre-Split Tilt 3 " Cowl FCGI-57CP $1949. 57 OPFE 3" Cowl Induct. FCG-72C $1499. 58-59 Tilt Front End FCGI-58 $1899. 58-59 One Piece Front End FCG-73 $1499. 58-59 Pre-Split Tilt Front End FCGI-58P $1999. 58-59 Front Fenders pr. FCG-42 $ 778. 55-66 Stepside Fenders pr. FCGF-59 $ 778. 55-59 Doors pr. FCG-62D $ 798. 58-59 Front Fenders pr. FCGF-58 $ 798. 55-59 Door skins pr. FCG-63K $ 398. 55-57 Front Wheel Wells pr. FCGW-55 $ 398. 55-66 Stepside Bedsides 6' FCG-55B $ 899. 55-59 Doors pr. FCGD-59 $ 898. 55-66 Stepside Fenders pr. FCG-45 $ 778. 55-66 Stepside Bed 6' w/Fdr FCGB-55S $3999. 55-66 Stepside Steps pr. sw FCG-45S $ 229. 55-66 Above Bed Tubbed FCGB-55T $3999. 55-59 Cameo Bed Kit FCG-56 $1499. 55-59 Cameo Bed Kit FCGK-56 $1699. 55-59 Cameo Rear Bumper FCG-57B $ 389. 55-59 Above Kit w/Bed FCGB-56C $3999. 55-59 Cameo Rear Bumper FCGB-57B $ 389. - One Piece Outer shell construction - with a few well hidden mold seams. - Smooth, easy to prep and paint, gray sandable exterior gellcoat finish. proper support of factory doors & hardware. - The unit arrives bare without dash, doors or any mechanical or electrical devices. - Headliner is supplied and comes with a smooth paintable gellcoat interior finish. - Drag-Package Includes: Race Weight Cab, Front End, Doors & Bedsides or Stepside fenders. Please e-mail or call us after placing your order. Reference your order number and specify your choice of hood and bedside or fender choice by part number. You MUST specify your type of racing so the parts can be made accordingly. Race weight parts only. Note: Factory installed floor braces may need to be trimmed or removed for desired fit. Cabs - although strong, straight, rust free & reliable - are not the project for the average "Joe". They are intended for the serious "Ground Up Builder" who has the time, money & experience to do the job correctly. All safety concerns must be taken up with the chassis shop involved with the project. Once finished these cabs look exceptional and should just about last forever, however, sit down and Please give some serious thought before ordering........We prefer that our customers be confident & educated in the amount of work required to complete this project and secure in the choice that you make. Please Note: We are unable to ship cab shells. They must be picked up in person to avoid freight damage. the front end, to help in closing. 10 - 15# more than a Drag Racing unit. Units manufactured for "Sand Drag" or "Baja" style racing are built so as to be midway between the Street Drag and the Mud Bog units. - Mold flashing must be removed or finishing. - Smooth grey gellcoat finish both inside and out. - Double wall posts support upper window and track. - Coremat� reinforced outer skin reduces "print thru". - Power window kits can be used to install one piece glass. - Original felts can be epoxied in the door post and side track. - Smooth gray gellcoat finish. Features:- Smooth gray gellcoat finish. - Detailed glove box design. - Double panel side walls, with a smooth gray gellcoat inner and outer finish. - Hollow sealed stake pocket - can be opened if desired for original appearance. support the same weight load as the original bed. - Tubbed bed allows for 21" clearance from tub to wheel opening flange. This allows for 20"-21" tires. The distance between the tubs is 33". - Installation time (after removal of original box ) 1-2 hours. To install - simply drill thru the bed and the under floor reinforcements and thru bolt it in place with O.D washers. It may be necessary to drill a new mounting hole through the existing frame. Drilling - sanding and possible notching of under floor braces may be required for correct installation of your NEW and IMPROVED, RUST FREE, DENT FREE bed assembly. (Ground wire required for electrical). - One piece construction on bedsides with taillight housing. - Sides bolt directly to original stepside box - without fenders. - Tailgate skin attaches to standard steel stepside tailgate. 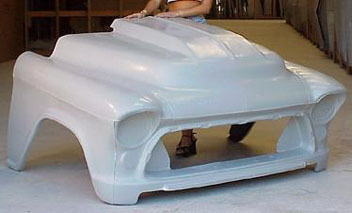 - Bumper is all one piece fiberglass construction and not intended for collision.